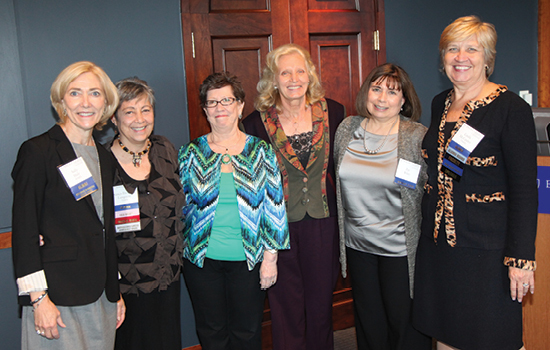 The 2013 NAA award winners, shown with Dean Linda McCauley (right), are Sally Hale (left), Nancy Langston, Jane Mashburn, Amy Spangler, and Patricia Riley. The Nurses' Alumni Association (NAA) presented the following honors during Homecoming 2013. These annual awards recognize alumni and friends who advance the School of Nursing and the nursing profession. During her 22 years as dean and professor at Virginia Commonwealth University School of Nursing, Nancy Langston 72MN transformed the school into a national leader in nursing education and research. Among many accomplishments, she is founding chair of the National League for Nursing (NLN) Foundation and a fellow of the American Academy of Nursing and the NLN Academy of Nursing Education. Says Langston of her graduate nursing education at Emory, "It's where I became a true professional with a vision for my work." Several years before Jane Mashburn 78MN retired from the School of Nursing faculty in 2012, she achieved notoriety by raising the school's profile in graduate education. Under her leadership as MSN program director, the nurse-midwifery program was ranked 13th and the pediatric nurse practitioner program was ranked 11th by U.S. News & World Report. "The thing I'm proudest of is the influence I've had on so many nurse-midwifery students," says Mashburn, a fellow of the American College of Nurse-Midwives. In 1993, Sally Hale 80MN became one of the first nurses in Georgia to be certified in pediatric nursing oncology, a certification program that she helped design. That was after she joined Camp Sunshine, a local nonprofit that offers programming for children with cancer, as executive director in 1987. Today, the organization provides nearly 140 programs for more than 900 children statewide. "I'm a nurse in my role today as much as I was when I graduated from Emory," says Hale. Amy Spangler has devoted her career to making breastfeeding easier for parents. Her first book, Breastfeeding: A Parent's Guide (1985), is now in its ninth edition. In 1987, she founded a company to educate parents and health professionals about breastfeeding and infant/child nutrition. The company expanded into a successful online news site now known as baby gooroo. "I've taken a different path then what I thought I'd be on," says Spangler, an adjunct faculty member. "But you never stop being a nurse." Patricia Riley has spent nearly four decades with the CDC, where she currently serves as a senior nurse-midwife in the Maternal and Child Branch of the Division of Global HIV/AIDS. She also teaches on an adjunct basis and partners with the Lillian Carter Center for Global Health & Social Responsibility on workforce systems and nursing regulations and education in Africa. Her advice to nursing students and alumni: "Always look for a third way," she says. "Look for a way to thread the needle and make that happen."